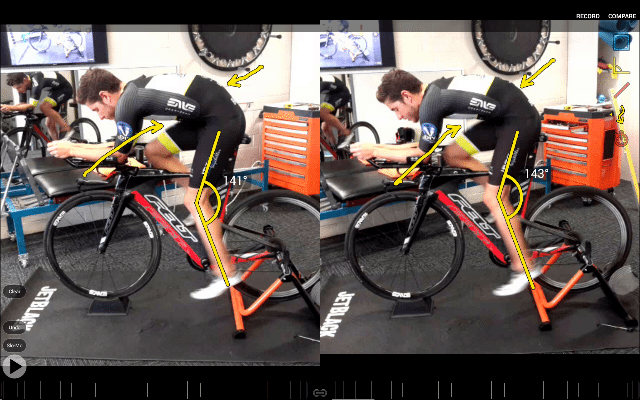 World Class “Bikefit” Technology in Expert Physiotherapists’ hands! Bikefit is the process of professionally fitting a bicycle to its rider, ensuring ideal positioning that maximises each rider’s athletic input while minimising impact on vulnerable parts of the body. As physiotherapists with additional knowledge and experience in cycling and cycling biomechanics, we are highly trained to assist you to achieve the ideal position on the bike whether it is to alleviate pain or an injury, or assist you to be in an ideal position to prevent injury, maintain your health, and cycle efficiently. Our professional physiotherapy fit is achieved with the help of world leading, state-of-the-art technology. We are the only physiotherapy clinic in Australia to offer dynamic pressure analysis at the saddle and feet alongside high speed video technology- with twice the frame rate of Retul and BG Fit systems for greater accuracy..
Star Physio’s managing Director Damian Oldmeadow is internationally recognized and teaches nationally and internationally in bikefit and cycling injury management and prevention. He is the Australian Education Partner for Gebiomized which allows the Star Physio Bikefit Team to always be at the forefront of evidence based bikefit. Throughout the extended physiotherapy consultation including your bikefit, we use high speed motion capture video analysis combined with saddle stability and pressure analysis to show you your positioning and compare adjustments made. This combined with our physiotherapy skills and tools, ensure all measurements are accurate. After your consultation, you’ll receive before and after pictures of your cycling position as well as the appropriate measurements and recommendations regarding identified issues from the physiotherapy assessment to maximise your cycling experience. Star Physio is the industry leader in WA for physiotherapy led professional bikefit services for comfort, performance and injury treatment and prevention. We offer a range of extended physiotherapy consult with bikefit options to suit everyone. Have a read through our bikefit services, and if you are not sure which one is the most appropriate for you, give us a call or send us an email and we will work this out with you. We have a preciously held reputation at Star Physio of being a master of technology instead of its slave. When technology presents a clear advantage to our understanding of the interaction between rider and bike, we are happy to lead WA in its implementation. Regardless of this technology, the best fit still relies on the expertise, qualifications and experience of the physiotherapist and fitter, to interpret all of the information available, including the subjective and objective physiotherapy assessment findings, and put this all together to create a fabulous fit for you! We always say that bike fitting is a process and not an event and we recommend regular follow-up appointments to check if any changes are needed to your new position should your body or aspirations change. Our bikefit interventions are conducted by physiotherapists as part of injury treatment, prevention and general exercise advice or as part of a treatment plan, and as such are eligible for private health rebates. Our services are billed as extended physiotherapy consults. Contact your private health provider if you want to check how much you will get back on your consult, and also to ask which code we can use to give you maximum benefit. Star Physio’s unique German-engineered Bikefit equipment gives us detailed pressure analysis at the saddle and at the pedals for comfort, efficiency and performance. We also collect accurate data to help us understand the cause of cycling pain and injuries, be they present or potential, allowing us to find the optimal position for every cyclist. Nearly all of our “bikefit” clients present with some degree of pain or discomfort, and many have significant previous injuries or deficits in flexibility which require our skills as physiotherapists to find the appropriate position to protect vulnerable areas. Our primary goal as physiotherapists is to help you find a position while cycling to minimise this pain and prevent injury. Our GebioMized equipment also incorporates high speed cameras for accurate digital measurement of specific angles to give us a true 3D picture of your cycling. Using this technology we are able to gain valuable and incredibly accurate objective information that is often missed in bike fitting performed with inferior technology. More important still than any technology is to have a professional physiotherapist to interpret this information to work with you to find your ideal position. Star Physio is the exclusive provider of “Bikefit” professional physiotherapy bike fitting services using the latest GebioMized equipment in Western Australia. We are proud to partner with Gebiomized and work closely with our German colleagues, who also include physiotherapists, to ensure that we are at the forefront of professional physiotherapy led bikefit internationally.